To update and ADSO in near-realtime, one has to consider the Process Chain for Streaming (available since BW 7.5 SP03; information can be found at https://help.sap.com/viewer/2e90b26cf7484203a523bf0f4b1bc137/7.5.4/en-US/ac029de05e164a12ac1ce08d16180f05.html). Using RDA (realtime data acquisition) does not support updating ADSO’s (only cubes, classic DSO’s, and alike), and has thus become yet another obsolete BW-artifact. This blog shows the setup in a nutshell in context of both ODP-SAPI and ODP-SLT datasources. In this case, the basis are the well-known (sometimes rich in business-logic) extractors. In this example, I’ve used the 2LIS_11_VAITM “Sales Document Item Data”, for which I’ve set the Update Mode to “Direct Update” in the Logistics Workbench in the source system (this aspect is covered sufficiently elsewhere). Remark that there is also no need to use PSA-level due to the usage of ODQ; so both qRFC as PSA level is being replaced via one ODQ-queue. Due to the usage of Direct Update, any change in the transactions (in this case VA01 or VA02, or alike) will immediately insert the change-records into ODQMON-queue; very alike the behavior in RSA7, actually. One can use this part for further batch-processing, with whatever target-BW-object. The transformation is just a straightforward 1:1; the ADSO is purely field-based (just had to indicate the right key-elements and some key-figure aggregation behavior). All this can actually be performed in a couple of minutes. Now the fun starts : we want to use this setup to update the ADSO as soon as possible. Trying to create a DTP of type “RealTime” is not possible : it is removed from the drop-down list as soon as the target is and ADSO !! Once (and as long as) this Streaming Process Chain is scheduled, you will find one request in ODQMON which has status “Extraction Running”; as soon as the Streaming Process Chain is out of scheduling this request receives the status “Confirmed”. As a consequence, the process chain is running with the indicated frequency (pull). Herewith the resulting view of updates of the ADSO. In case it is necessary to replicate a table, or if a delta is not easily available via the above described extractor technique, one can use SLT. To update the SLT-queues towards BW yet another ODQ-layer can be introduced. Then I’ve created a field-based ADSO using this datasource as a template, and a 1:1 transformation between the datasource and this ADSO. This is all depending on the use-case at hand. Once done, a normal delta-DTP can be created. The first execution of this might take a while, as this is setting up the SLT-specific delta-capturing mechanism in the source-system; it will finally also result in an initial load data-set (and an additional initial line in SLT/ODQMON). Again : you can use the above for batch-purposes. To now start streaming the changes towards the ADSO, put the delta-DTP in a process-chain, flag “streaming”, and schedule. 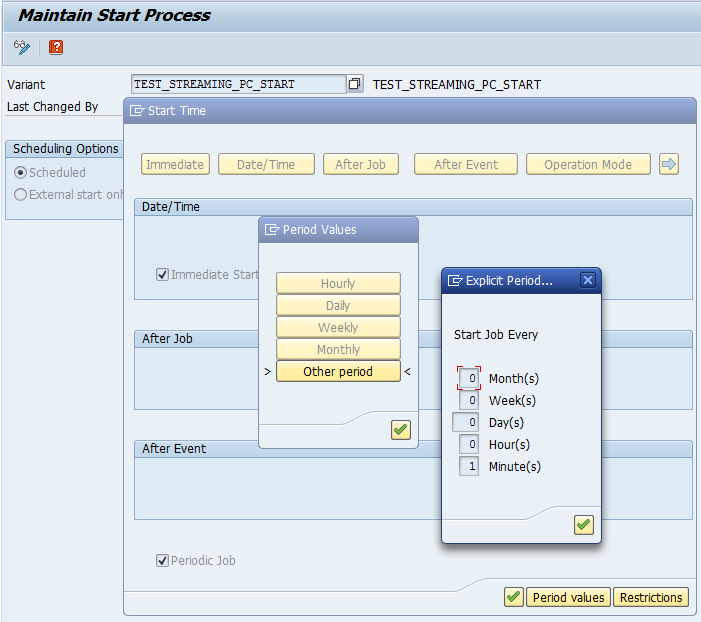 Remark : if you schedule according to ‘API’, the process chain will be triggered event-based via ODQ !! Meaning : this is a real-time push-mechanism. Although SLT is purely table-based, so it doesn’t contain any business logic in itself, it it a very powerful delta-enabling technique, and it is capable of pushing changes in real-time to BW’s ADSO’s. Could you please tell whether this would mean that the only difference in time measure of ~realtime replication between SLT and SAPI is ~one minute? There is another difference : SLT only leaves an update-package in the data-staging when there is a real update, whereas SAPI (polled way of working) is actually leaving a trace per minute. I didn’t notice much more differences yet. Does streaming work on all types of Datasources ? Fi/CO ? Streaming is only connected (as far as I know) to SLT-triggers (or compatible). So I don’t think you can use the existing extractor framework as trigger for event-based staging. If you would however use an SLT on ‘the main’ table regarding your extractor (e.g. BSEG), to know that there is a change, you could use the delta-capable regular extractors to process the delta’s. Hi – We have configured a PC for Streaming which is extracting data from a Table EKKO using ODQ/SLT Technique. Would you suggest the idle periodic interval for the process chain? 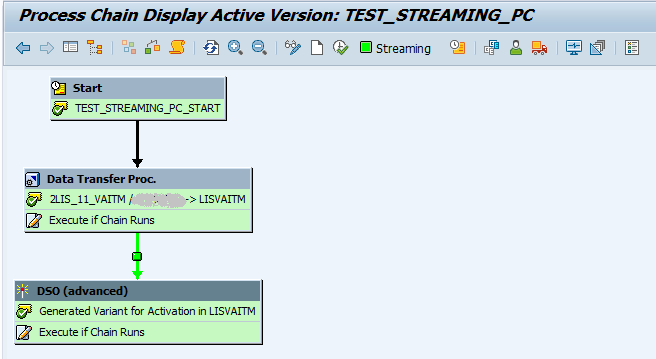 Hi – It seems ODP/SLT is failing to send an event to trigger the Process Chain in Streaming Mode.Any idea on this. we have noticed the same behavior in our current project. 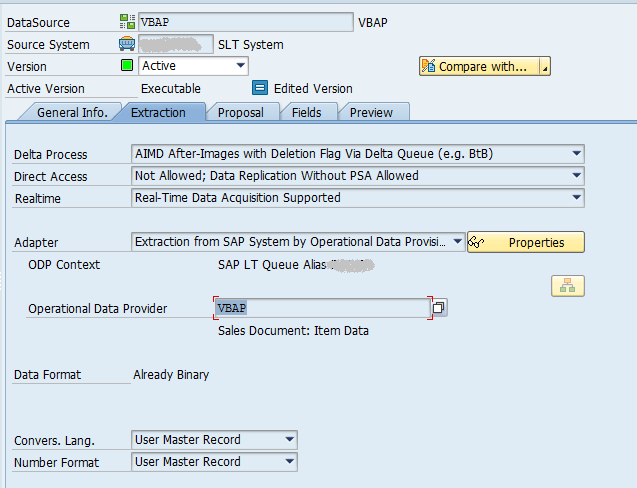 The implementation is: MSSQL -> SLT/ODP -> SAP BW 7.5 where the target of our data flows is mainly an advanced DSO. We have done the delta initialization and then we have put the DTP(s) in a streamng process chain (scheduled according to API ) and we can see the real time request in the ODP queue(ODQMON). The real time daemon job (ODQ_DAEMON_CLIENT_XXX) is correcty running every 15 minutes and we expect the process chain automatically triggered as soon as there ia a change done at source tables level but it does not happen (If we manually trigger the process chain or we manually execute the DTP the delta records are correctly extracted). Did you manage to find the root cause of the issue? We are doing SAP ECC—>SLT—>BW, due to Time Zone issues in SLT sever we had issues with Real Time Streaming Issues, but now after correcting the Time Zone Issue it seems Real Time streaming is working and still we are doing testing to confirm that everything looks good. will confirm you back on this. We are facing the same issue. Please let us know what was done to correct the time zone issue. Also let us know if the testing was successful. Is your testing complete? Please share the steps taken to correct the time zone issue. We also have troubles with streaming process chains, I’ve found a very important SAP note “Important corrections for the usage of Streaming DTP-s and Process Chains“. 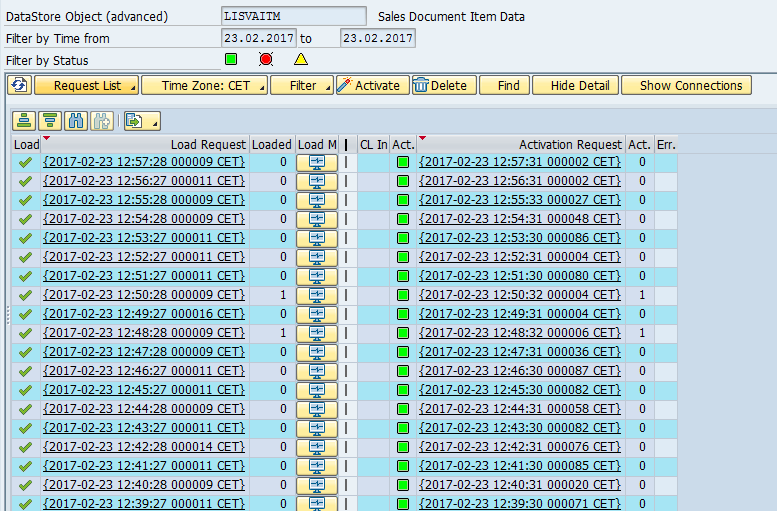 SAP also recommended me to implement the note first (with more than 30 prerequisite notes and 70 optional notes). Streaming process chains are new in BW7.50 and need some corrections first. Please let us know if you are facing a similar issue to the one below and please share any additional steps you took to resolve it once the issue is resolved. 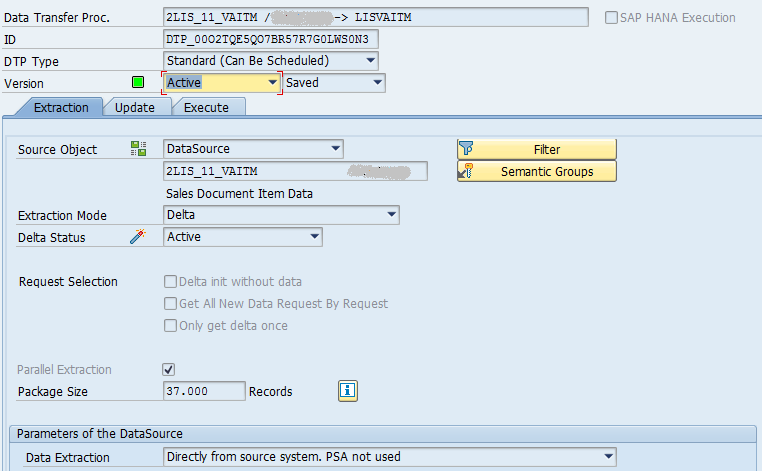 The implementation is: MSSQL -> SLT/ODP -> SAP BW 7.5 where the target of our data flows is mainly an advanced DSO. We have done the delta initialization and then we have put the DTP(s) in a streaming process chain (scheduled according to API ) and we can see the real time request in the ODP queue(ODQMON). The real time daemon job (ODQ_DAEMON_CLIENT_XXX) is correctly running every 15 minutes and we expect the process chain automatically triggered as soon as there is a change done at source tables level but it does not happen (If we manually trigger the process chain or we manually execute the DTP the delta records are correctly extracted). 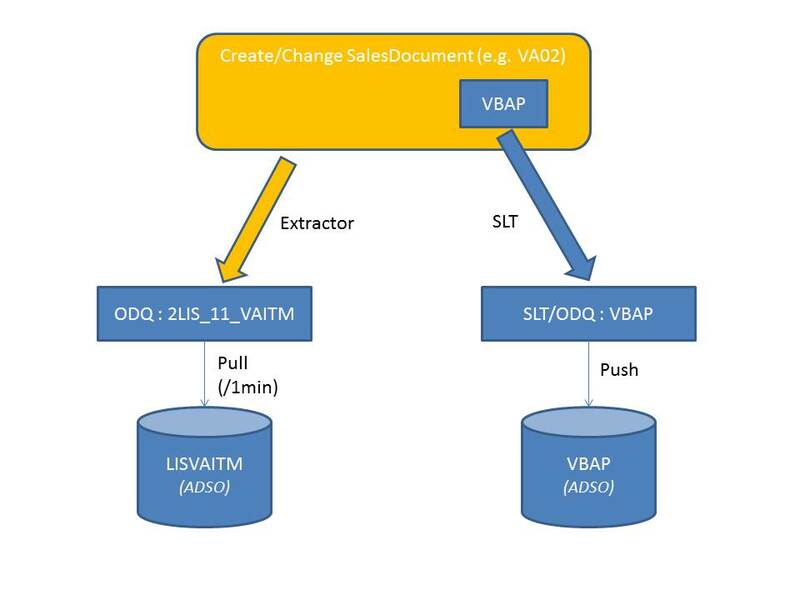 Is it possible to leverage ODP and delta enabled standard extractors for real time replication into Native HANA. We do not have BW license and hence process chain option is not available. imagine and Stream PC ADSO getting real-time data, what if one request fail? Must I unschedule the Stream PC first? then remove the request? will I recover all data missed during downtime, resolving ADSO request issues? Is there a kind of step by step to solve this situation? I tried this ODQ approach for 0FI_GL_4 with streaming enabled. The process chain now is running every minute. I changed the record in ECC system, the streaming process chain did not bring the delta for next 15 runs, all the time it was 0. After the chain was removed from the scheduled and streaming, ran the DTP manually and it brought those delta records. Could you please help to understand why streaming process is not bringing the delta?